Scattered throughout the world, but more abundant in the temperate regions of America, there are three hundred and fifty species of plants that are closely related and grouped by the botanists as the evening primrose family. This family includes a number of interesting plants. Here are classed the fuchsias, or ladies' eardrops, of which there are many brilliant varieties under cultivation as house plants. These are natives of the mountain regions from Mexico southward. 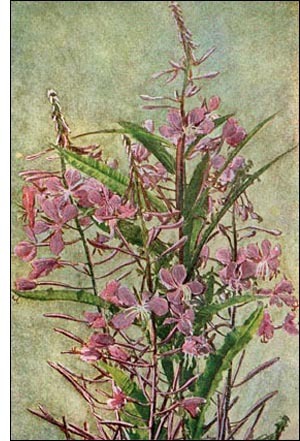 Another cultivated plant is the Clarkia, a native of Oregon and California. The Fire-weed is a plant of the open country and not of the forest. It must have a great deal of sunshine. When its seeds fall in the deep shade of a dense forest, where the rays of the sun penetrate but a short distance, if at all, they cannot grow. But let the woodman or a fire lay low or destroy the noble growth of trees, then there is soon a transformation, the landscape is enlivened by the bright flowers of the fire-weed.